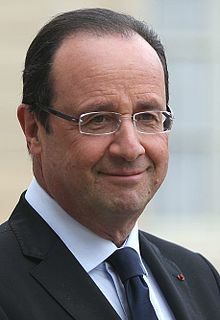 French President Francois Hollande, 59, appears to have finally found an initiative that resonates with the public. While 80 percent to French citizens view him as ineffective and his massive taxation policies have led to both companies and citizens fleeing the country, his polarity has taken small uptick with revelations of his affair with actress Julie Gayet, 41. The affair reportedly sent his long-standing partner Valerie Trierweiler, 49, into a hospital. It certainly captures a difference between U.S. and French politics. Gary Hart was not even married but a brief dockside party with Donna Rice was enough to sink his career. Hollande’s approval rating rose to 31% from 26% in the aftermath of the affair’s disclosure. Of course, a popularity rating of 31% is hardly inspiring and, at a five percent increase, he would require four more affairs to just get above fifty percent. That is a lot even for a healthy amorous Frenchman. In comparison, President Obama is hovering at a 39% percent popularity, which he blames in part on racial animus. Obama noted that “There’s no doubt that there’s some folks who just really dislike me because they don’t like the idea of a black president.” Of course, any suggestions from Hollande on how to improve such polls might not go over well with the First Lady. The French tend to treat personal lives as personal but stories on such matters are treated as a violation of privacy. Moreover, the public is clearly comfortable with nonconventional unions. Hollande had a 30 year relationship with fellow Socialist leader Ségolène Royal that produced four children. In 2007, however, around the time of Royal’s defeat, they split and a few months later Hollande took up with French journalist Valérie Trierweiler. She was a reporter for the magazine Paris Match and later moved into the Elysee palace with Hollande when he became president. All of that is unimaginable for an American president. The question is how two countries can have such sharply divergent expectations for leaders and the perceived relevance of their personal relationships. Do you believe that an affair (even with a partner as opposed to a spouse) is relevant to the view of a public figure? Relationships are private…. In this realm, Americans are truly revolting.